If you walk your dog(s) at Russell Park what are you thoughts? You can leave a comment at the end of the article or leave your user rating between 1-5 stars. When we first moved to Bedford in 1996 we lived on the South end of Bower Street. There is no through traffic and it was great for taking dogs and kids straight down to Russell Park without having to cross any roads. Things have got even better over the years, with the addition of new facilities for all walkers, kids, and families. The park is a main venue for The Bedford River Festival. In future I shall be writing a separate item specifically about this huge and important local event. It’s also the location for the Bedford kite festival and other events. We used to enter the park from Bower Street but maybe have a mooch round Castle Road shops first. If driving with a dog in the car then parking is free and generally easy to find on Russell Avenue and Shaftesbury Avenue. There is a big open field which comprises the football pitches. This is where we would play ball games with Lio once he was good with recall off the lead. The park is not enclosed by walls or fences and there are roads on 3 sides including The Embankment which is quite a busy main road. Good paved pathways go right round and although the park is small its fine for a leisurely half hour walk. You can extend it if using the recently revamped children’s play park round to the left. Or you could head to ‘The Kiosk’ Café down in the corner near the tennis courts and Embankment. There is a popular pitch n putt by The Kiosk. I’m going to have a special item soon specifically about The Kiosk and its sister café The Pavilion in Bedford Park. 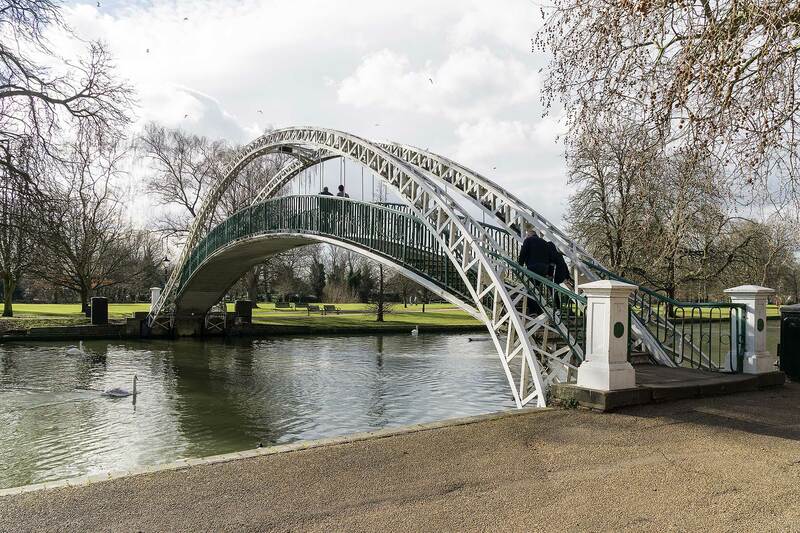 Both are hugely valuable success stories which have really enhanced what Bedford has to offer residents and visitors over the last few years. I will be providing regular updates on specific events, promotions and activities too. There is often an ice cream van in this corner too. With Lio, we used to cross over the Embankment road and then the river via the little white painted bridge or the modern ‘Butterfly Bridge’. Then along towards town on the path with the river (and lots of rowers) on the right and a leisure Boating Lake on the left. This path is quite busy with cyclists, runners, walkers, dogs, families, ducks and geese. Therefore it might be a good idea to keep dogs on leads here. There is a café at the Boating Lake which I haven’t been to for a while. I’ll report back about it in a future post. Then the busy Bedford Modern School Rowing Club house and boat sheds. It’s always interesting to see the boats being carried in and out. Then over the narrow footbridge to Longholme area. Again dog on lead essential really as a bit of a narrow space for encountering small children /unknown dogs etc). Things then open out into a big clear field, popular for dog walking, with our iconic Victorian footbridge on the right and bandstand straight ahead. There is another stretch of river to the left, and dogs (particularly young ones exploring) have been known to jump in for a swim or a stick and not be able to get out easily. This is obviously a risk for owners too if having to assist, good to be aware of although I’ve never heard of serious incidents thank goodness. It’s a lovely place to be and watch the world (and its dogs) go by. At this point you can opt to cross back over the river on the Victorian Footbridge then left to town via path on North side of Embankment. Alternatively back up to where you started / parked or around the lovely shops on Castle Road. I’m going to write future items about specific Castle Quarter shops and services with reviews from resident and visiting users. Special interest for dog owners – there is Dog Grooming parlour called BOW WOW on Castle Road. I hope to give more info re services, contacts etc soon after liaising with them. I know they are popular and provide qualified, respected and professional services. So overall the Russell Park / Longholme area is great space for most (well behaved!) dogs. Mostly good in terms of drainage / mud issues and well maintained. Terrain is varied and there is plenty to do for everyone. There are good facilities for refreshments. It’s all set in a very positive, thriving community with real heart. I believe there is a Social Group of dog walkers who meet regularly in Russell Park in the afternoons. I will post some further info once I have met them, confirmed details and got their permission.